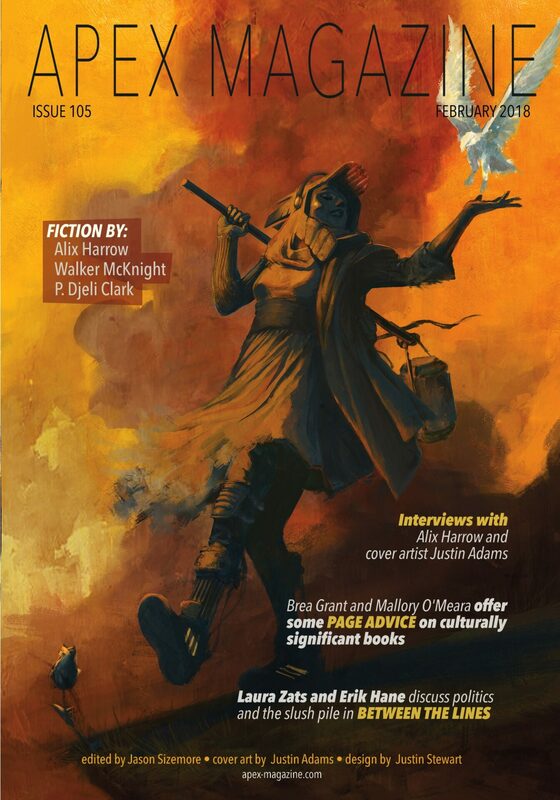 This issue includes a reprint and much non-fiction in addition to the two new short stories. I call “Work, and Ye Shall Eat” a “science fantasy” because it starts like a present day realistic story with a scientifically possible twist, such that it might be SF, but it then fades into surrealism. (Any sufficiently advanced literary story is indistinguishable from fantasy.) The administrator of a sort of “Colonial Williamsburg” narrates, in diary form, the tale of her fellow employees being sequestered behind a double barrier of electric fences with only a rare, single point of contact to a military liaison who won’t explain what’s going on. Then the soldiers disappear and other things start disappearing and appearing and occasionally getting electrocuted and it all gets very strange. If you are interested in the mystery and not put off by the glacial pace and unappealing protagonist and enjoy puzzling out the (Eloi/Morlock? self-limiting mentalities?) theme, you might enjoy this but, otherwise, very likely won’t. The mystery that concerned me is that I know I’ve read “colonial re-enactment” stories and many, many, “sequestered behind a military barrier” stories (which account for almost the totality of this story) but I can’t bring any of them to mind. Turning to “A Witch’s Guide to Escape,” when a librarian of the good, witchy kind notices a neglected orphan, whose soul is being crushed by his unpleasant life, repeatedly showing up in the fantasy section, she fights with the desire to break the witch-librarian rules and end her career by giving him one of their secret books to help him. I have to confess up front that, while I wasn’t a big fan of the last story I read by this author (“The Autobiography of a Traitor and a Half-Savage”), she hit my radar with “The Animal Women” and, especially, the award-worthy “A Whisper in the Weld” (old review), so I was excited to see a story from her in this issue. I’m not sure that this equals “Whisper” but it’s certainly very good and, while I enjoy her historical settings and she does them well, I was especially pleased that this was a contemporary fantasy. This is a simile-laden tale and a bit explicitly about “the sacred wholeness of reader and book” but it succeeded in continually making me feel like the Grinch when his heart was growing. I’ll grant that a story about a reader of the fantastic which is to be read by readers of the fantastic takes aim at an easy target but it’s still conceived, constructed, and characterized very well (seeing the external view of the boy through the verbose viewpoint of the librarian could be criticized but I think effectively allows the reader to participate in the writing), and it’s full of arresting images and expressions, which conspire to continually play effectively on the reader’s emotions. This entry was posted in Reviews and tagged 2018, Alix E. Harrow, Apex, Digital, Fantasy, Recommended, Short Story. Bookmark the permalink.